For the 2009 film, see Beeswax (film). A beekeeper from Vojka, Serbia, making a bee hive frame. Beeswax (cera alba) is a natural wax produced by honey bees of the genus Apis. The wax is formed into scales by eight wax-producing glands in the abdominal segments of worker bees, which discard it in or at the hive. The hive workers collect and use it to form cells for honey storage and larval and pupal protection within the beehive. Chemically, beeswax consists mainly of esters of fatty acids and various long-chain alcohols. Beeswax has been used since prehistory as the first plastic, as a lubricant and waterproofing agent, in lost wax casting of metals and glass, as a polish for wood and leather and for making candles, as an ingredient in cosmetics and as an artistic medium in encaustic painting. Beeswax is edible, having similar negligible toxicity to plant waxes, and is approved for food use in most countries and in the European Union under the E number E901. The wax is formed by worker bees, which secrete it from eight wax-producing mirror glands on the inner sides of the sternites (the ventral shield or plate of each segment of the body) on abdominal segments 4 to 7. The sizes of these wax glands depend on the age of the worker, and after many daily flights, these glands gradually begin to atrophy. The new wax is initially glass-clear and colorless, becoming opaque after mastication and adulteration with pollen by the hive worker bees, becoming progressively more yellow or brown by incorporation of pollen oils and propolis. The wax scales are about three millimetres (0.12 in) across and 0.1 mm (0.0039 in) thick, and about 1100 are required to make a gram of wax. Honey bees use the beeswax to build honeycomb cells in which their young are raised with honey and pollen cells being capped for storage. For the wax-making bees to secrete wax, the ambient temperature in the hive must be 33 to 36 °C (91 to 97 °F). The amount of honey used by bees to produce wax has not been accurately determined. The book, Beeswax Production, Harvesting, Processing and Products, suggests one kilogram (2.2 lb) of beeswax is used to store 22 kg (49 lb) honey. :41 According to Whitcomb's 1946 experiment, 6.66 to 8.80 kg (14.7 to 19.4 lb) of honey yields one kilogram (2.2 lb) of wax. :35 Another study estimated that 24 to 30 kg (53 to 66 lb) of honey are produced per one kilogram (2.2 lb) of wax. When beekeepers extract the honey, they cut off the wax caps from each honeycomb cell with an uncapping knife or machine. Its color varies from nearly white to brownish, but most often a shade of yellow, depending on purity, the region, and the type of flowers gathered by the bees. 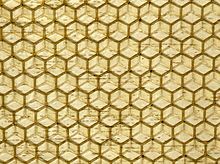 Wax from the brood comb of the honey bee hive tends to be darker than wax from the honeycomb. Impurities accumulate more quickly in the brood comb. Due to the impurities, the wax must be rendered before further use. The leftovers are called slumgum. The wax may be clarified further by heating in water. As with petroleum waxes, it may be softened by dilution with mineral oil or vegetable oil to make it more workable at room temperature. Beeswax is a tough wax formed from a mixture of several chemical compounds. Triacontanyl palmitate, a wax ester, is a major component of beeswax. An approximate chemical formula for beeswax is C15H31COOC30H61. Its main constituents are palmitate, palmitoleate, and oleate esters of long-chain (30–32 carbons) aliphatic alcohols, with the ratio of triacontanyl palmitate CH3(CH2)29O-CO-(CH2)14CH3 to cerotic acid CH3(CH2)24COOH, the two principal constituents, being 6:1. Beeswax can be classified generally into European and Oriental types. 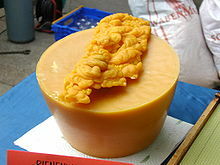 The saponification value is lower (3–5) for European beeswax, and higher (8–9) for Oriental types. Beeswax has a relatively low melting point range of 62 to 64 °C (144 to 147 °F). If beeswax is heated above 85 °C (185 °F) discoloration occurs. The flash point of beeswax is 204.4 °C (400 °F). Density at 15 °C is 958 to 970 kg/m³. When natural beeswax is cold,[clarification needed] it is brittle, its fracture dry and granular. At room temperature it is tenacious and it softens further at human body temperature. The specific gravity at 15 °C (59 °F) is from 0.958 to 0.975, that of melted wax at 98 to 99 °C (208.4 to 210.2 °F) compared with water at 15.5 °C (59.9 °F) is 0.822. Candle-making has long involved the use of beeswax, which is highly flammable, and this material was traditionally prescribed for the making of the Paschal candle or "Easter candle". Beeswax candles are purported to be superior to other wax candles, because they burn brighter and longer, do not bend, and burn "cleaner". It is further recommended for the making of other candles used in the liturgy of the Roman Catholic Church. Beeswax is also the candle constituent of choice in the Orthodox Church. Refined beeswax plays a prominent role in art materials both as a binder in encaustic paint and as a stabilizer in oil paint to add body. Beeswax is an ingredient in surgical bone wax, which is used during surgery to control bleeding from bone surfaces; shoe polish and furniture polish can both use beeswax as a component, dissolved in turpentine or sometimes blended with linseed oil or tung oil; modeling waxes can also use beeswax as a component; pure beeswax can also be used as an organic surfboard wax. Beeswax blended with pine rosin is used for waxing, and can serve as an adhesive to attach reed plates to the structure inside a squeezebox. It can also be used to make Cutler's resin, an adhesive used to glue handles onto cutlery knives. It is used in Eastern Europe in egg decoration; it is used for writing, via resist dyeing, on batik eggs (as in pysanky) and for making beaded eggs. Beeswax is used by percussionists to make a surface on tambourines for thumb rolls. It can also be used as a metal injection moulding binder component along with other polymeric binder materials. Beeswax was formerly used in the manufacture of phonograph cylinders. It may still be used to seal formal legal or royal decree and academic parchments such as placing an awarding stamp imprimatur of the university upon completion of postgraduate degrees. Purified and bleached beeswax is used in the production of food, cosmetics, and pharmaceuticals. The three main types of beeswax products are yellow, white, and beeswax absolute. Yellow beeswax is the crude product obtained from the honeycomb, white beeswax is bleached or filtered yellow beeswax, and beeswax absolute is yellow beeswax treated with alcohol. In food preparation, it is used as a coating for cheese; by sealing out the air, protection is given against spoilage (mold growth). Beeswax may also be used as a food additive E901, in small quantities acting as a glazing agent, which serves to prevent water loss, or used to provide surface protection for some fruits. Soft gelatin capsules and tablet coatings may also use E901. Beeswax is also a common ingredient of natural chewing gum.The wax monoesters in beeswax are poorly hydrolysed in the guts of humans and other mammals, so they have insignificant nutritional value. Some birds, such as honeyguides, can digest beeswax. Beeswax is the main diet of wax moth larvae. To strengthen and preserve sewing thread, cordage, shoe laces, etc. As the joint filler in the slate bed of pool and billiard tables. ^ a b Beeswax Production, Harvesting, Processing and Products, Coggshall and Morse. Wicwas Press. 1984-06-01. ISBN 978-1878075062. ^ Les Crowder (2012-08-31). Top-Bar Beekeeping: Organic Practices for Honeybee Health. Chelsea Green Publishing. ISBN 978-1603584616. ^ Top-bar beekeeping in America Archived 2014-07-29 at the Wayback Machine. ^ Umney, Nick; Shayne Rivers (2003). Conservation of Furniture. Butterworth-Heinemann. p. 164. ^ "LIPID MAPS Databases : LIPID MAPS Lipidomics Gateway". Lipidmaps.org. Archived from the original on 2014-06-05. Retrieved 2013-07-05. ^ Norman, Gary (2010). Honey Bee Hobbyist: The Care and Keeping of Bees. California, USA: BowTie Press. p. 160. ISBN 978-1-933958-94-1. ^ 1895-1979., Mayer, Ralph (1991). The artist's handbook of materials and techniques. Sheehan, Steven. (Fifth edition, revised and updated ed.). New York. ISBN 978-0670837014. OCLC 22178945. ^ "Statistics from: Food And Agricultural Organization of United Nations: Economic And Social Department: The Statistical Division". UN Food and Agriculture Organization Corporate Statistical Database. Archived from the original on 2011-07-13. ^ Peter J. Frosch; Detlef Peiler; Veit Grunert; Beate Grunenberg (July 2003). "Wirksamkeit von Hautschutzprodukten im Vergleich zu Hautpflegeprodukten bei Zahntechnikern – eine kontrollierte Feldstudie. Efficacy of barrier creams in comparison to skin care products in dental laboratory technicians – a controlled trial". Journal der Deutschen Dermatologischen Gesellschaft (in German). 1 (7): 547–557. doi:10.1046/j.1439-0353.2003.03701.x. PMID 16295040. CONCLUSIONS: The results demonstrate that the use of after work moisturizers is highly beneficial and under the chosen study conditions even superior to barrier creams applied at work. This approach is more practical for many professions and may effectively reduce the frequency of irritant contact dermatitis. ^ Congdon, L. O. K. (1985). "Water-Casting Concave-Convex Wax Models for Cire Perdue Bronze Mirrors". American Journal of Archaeology. 89 (3): 511–515. JSTOR 504365. 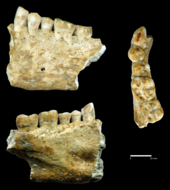 ^ "Oldest tooth filling may have been found – Light Years – CNN.com Blogs". Lightyears.blogs.cnn.com. Retrieved 2013-07-05. ^ "Don't Use Your Teeth". Archived from the original on 2013-12-14. Retrieved 2013-12-13. 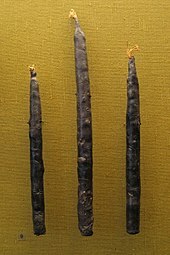 Wikimedia Commons has media related to Beewax. 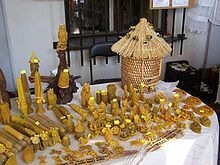 Look up beeswax in Wiktionary, the free dictionary.